The following businesses offer special offers, discounts, deals, freebies, coupons and more specifically for veterans, active duty military, reservists and military families. Some are only for Veterans Day; others are year-round! We will also be offering a FREE* Entree *up to $12 on Veterans Day (Sun 11-11-18) for Veterans + Active Duty who dine inside a 54th Street! AARP Veteran Membership — Exclusive for all members of the US Military Forces. AARP is proud to extend this very special offer of up to 25% off member benefits for the men and women of the United States Armed Forces who are 50+ years of age. Only AARP Members have access to the savings and discounts that come with an AARP Membership. Activate your membership today and join your fellow Active Duty, Military Retiree, Veteran, National Guard and Reservists, as well as spouse, in this very special, and exclusive offer. Allegiant proudly supports our U.S. active duty military, military veterans, members of the National Guard, military reserve and their dependents by offering select free services. 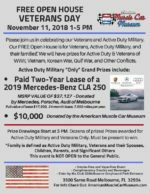 The American Muscle Car Museum will be celebrating veterans and active duty military this Veterans Day with a FREE open house event. This FREE open house is for veterans, active duty military and their families*. There will be prizes for active duty and veterans of WWII, Vietnam, Korean War, Gulf War and other conflicts. Prize Drawings start at 3pm. Dozens of prizes! Prizes awarded for active duty military and veterans only. Must be present to win. *Family is defined as Active Duty Military, Veterans and their spouses, children, parents and significant others. 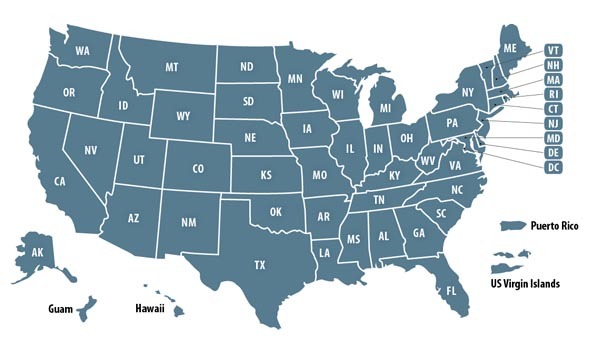 With valid active-duty United States Armed Forces identification cards, active-duty US military personnel, their spouses and their dependents are eligible to receive a 10% discount on the lowest available rail fare on most Amtrak trains, including for travel on the Auto Train. Just use the Fare Finder at the beginning of your search and select 'Military' for each passenger as appropriate to receive the discount. The military discount is not valid with Saver Fares. The military discount is not valid on weekday Acela Express trains. The military discount does not apply to non-Acela Business class, First class or sleeping accommodation. These upgrades are permitted upon payment of the full accommodation charges. The military discount is not valid for travel on certain Amtrak Thruway connecting services. The military discount is not valid on the Canadian portion of services operated jointly by Amtrak and VIA Rail Canada. The military discount may not be combinable with other discount offers; refer to the terms and conditions for each offer. For the tenth consecutive year, Applebee's Neighborhood Grill + Bar® will honor veterans and active members of the United States military by offering each a free meal at any of the nearly 1,800 Applebee's restaurants in the United States on Veterans Day, Saturday, November 11, 2017. Applebee’s is one of the first casual dining brands to honor America’s heroes with a free meal on Veterans Day and has donated more than 8.3 million free meals to veterans and active-duty military since beginning the program in 2008. Applebee’s restaurants nationwide expect to serve nearly one million more free meals this Veterans Day. The American Standard Burger – Juicy all-beef patty with seared-in bacon, diced onions and pickles topped with melted American cheese, our signature sauce and a Brioche bun. Served with fries.Butcher’s Meat + Potatoes – USDA Choice top sirloin, tomatoes, mushrooms, stout gravy, garlic mashers and crispy onions. Three-Cheese Chicken Cavatappi – Asiago, Parmesan and white Cheddar are mixed with corkscrew cavatappi pasta in a rich Parmesan cream sauce and then topped with grilled chicken, bruschetta tomatoes and basil. Chicken Tenders Platter – Crispy breaded chicken tenders are a grill and bar classic. Served with fries, slaw and honey Dijon mustard. Fiesta Lime Chicken® – A celebration of flavor, this dish delivers on every level. Grilled chicken glazed with zesty lime sauce and drizzled with tangy Mexi-ranch is smothered with a rich blend of Cheddar cheeses on a bed of crispy tortilla strips. Served with Spanish rice and house-made pico de gallo. Double Crunch Shrimp – Crispy battered shrimp are fried golden brown. Served with cocktail sauce, tartar sauce, slaw and fries. Oriental Chicken Salad – A long-running favorite, crispy breaded chicken tenders top a bed of Asian greens, rice noodles and almonds tossed in our Oriental vinaigrette. Also available with Grilled Chicken. This event is only one of the many ways that franchisees around the country honor and support our American heroes. Other initiatives supported by local franchisees include participating in veteran employment recruiting programs, sending much-needed items to active military service members in Iraq and Afghanistan, delighting hometown heroes with surprise parties and Applebee’s gift cards, and partnering with organizations to repair or build homes for veterans in need. Complimentary meals from the Veterans Day menu will be available for dine-in only at the nearly 1,800 Applebee's locations nationwide. In order to receive a free meal on Saturday, November 11, 2017, guests need to provide proof of military service, which includes: U.S. Uniform Services Identification Card, U.S. Uniform Services Retired Identification Card, Current Leave and Earnings Statement, Veterans Organization Card, photograph in uniform or wearing uniform, DD214, Citation or Commendation. For more information, please visit www.applebees.com/veterans-day-free-meals. Hours vary by location, and guests are encouraged to call their local Applebee's restaurant in advance to inquire about specific location hours. Offer valid on Saturday, November 11, 2017 at participating Applebee’s restaurants. Item selection and participation may vary. Dine-in or carry out only from limited selections. Not valid with other coupons or discounts. Beverages and gratuity not included. Veterans and active-duty military simply show proof of military services. Limit one (1) meal per veteran or active-duty military. Hours vary by location, so guests should call their local Applebee's restaurant in advance to inquire about specific location hours. Business Website Address: View Applebee's website for locations, details and more. Many websites show that participating Arby's locations offer a discount of 10%. The locations vary by location. Please contact your local Arby's restaurants to verify if they participate. Be sure to bring your Military ID or Veterans ID with you. Veterans and active duty military personnel get a free meal from a fixed menu on November 12 at participating Arooga's locations. Be sure to check with your local Arooga's prior to ordering! Back Yard Burgers will give all active duty servicemembers and veterans a free Back Yard Classic Burger on Veterans Day. Be sure to check with your local Back Yard Burgers prior to ordering! Active duty military and veterans will enjoy a free breakfast from a select menu on November 11. Also receive a 20% off the entire check coupon valid for their next visit. Be sure to check with your local Bakers Square prior to ordering! On Veterans Day veterans and military personnel can enjoy a free burger or flatbread up to a $15 value at Bar Louie. Be sure to check with your local Bar Louie prior to ordering! 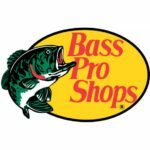 Bass Pro Shops is pleased to offer the active military, veterans, retirees, National Guardsmen and Reservists of our Armed Forces a 5% discount every day, year-round at U.S. Cabela’s and Bass Pro Shops stores, simply present proper ID at checkout. Exclusions apply*. 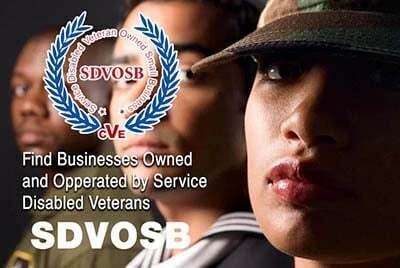 Actively recruiting veterans to join our team, with thousands of armed services veterans on our workforce. Donating millions to AMVETS and USO through longstanding partnerships and encouraging our customers to join us in our efforts. Hosting events that help recovering veterans connect with nature like Fishing Dreams for Veterans, a series of special fishing tournaments for disabled veterans. Compiling care packages for Special Forces units with hundreds of packages sent from our team members every year. Heroes like you deserve an offer like this! Veterans Eat FREE on Monday, November 12th. With purchase of equal or greater value up to $10. Proof of service required. Not valid with any other offer, discount, promotion or purchase of gift cards. Tax, alcohol and gratuity not included. One offer per person, per visit. Valid for dine in or take out at participating locations on 11/12/2018 only. To all who've served in the military, past or present, Beef's would like to thank you for your service. Please join us as we salute you with a meal. Every Tuesday at Belk & Belk.com, it's Senior, Teacher & Service Day. It's our way of saying thanks to all of the active military, veterans, teachers & seniors in our community by treating them to an extra 20% off(15% off home/shoes). We appreciate each & every one of you! A buttermilk biscuit topped with one egg cooked-to-roder, crumbled Bob Evans® Sausage, country gravy and cheddar cheese. Served with has browns, home fries or grits. Two slices of griddled Brioche bread, dipped in real egg batter, vanilla and cinnamon. Served with butter and syrup. One egg cooked-to-order, hash browns, home fries or grits, two sausage links or bacon strips and a biscuit. A stack of four fluffy hotcakes served with butter and syrup. Multigrain hotcakes contain sweet, crunchy granola as well as sunflower, flax and sesame seeds. A traditional favorite served with mashed potatoes and topped with country gravy. *One free item from this menu only valid for Veterans and Active Duty Military personnel on November 11, 2018 at all Bob Evans Restaurants. Not valid with other offers, discounts or coupons. Dine-in only. Veterans and active duty military simply show proof of military service. Proof of service includes: US Uniformed Services ID Card, US Uniformed Services Retired Card, current Leave and Earnings Statement (LES), veterans organization card (i.e. American Legion, VFW), photograph of yourself in uniform, wearing uniform, DD214, and citation or commendation. Beverages and gratuity not included. Tax additional where applicable. Veterans and active duty military will receive one small order of wings and a side of fries for free on Veterans Day. Be sure to check with your local Buffalo Wild Wings prior to ordering! Cabela’s is pleased to offer the active military, veterans, retirees, National Guardsmen and Reservists of our Armed Forces a 5% discount every day, year-round at U.S. Cabela’s and Bass Pro Shops stores, simply present proper ID at checkout. Exclusions apply*. California Pizza Kitchen will give Veterans and active duty military a complimentary entree from a special menu on November 11. 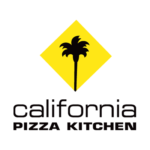 Be sure to check with your local California Pizza Kitchen prior to ordering!